A fugitive navigating London's underbelly, Jane rights wrongs on behalf of the have-nots whilst avoiding the noose. Until an advertisement catches her eye. Her aunt has died and the new master at Highgate House, Mr. Thornfield, seeks a governess. Anxious to know if she is Highgate's true heir, Jane takes the position and is soon caught up in the household's strange spell. When she falls in love with the mysterious Charles Thornfield, she faces a terrible dilemma: can she possess him - body, soul and secrets - and what if he discovers her murderous past? When we first meet Jane Steele, she is a young girl living in isolation. She still has her mother, an artistic woman with a fragile personality, in her life. All that changes when her mother commits suicide, followed by the accidental death of Jane's cousin Edwin Barbary. 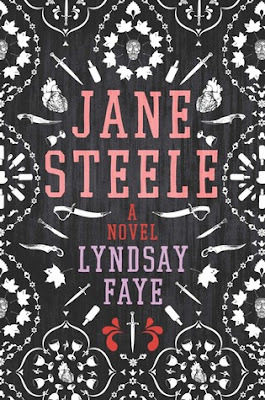 At this point in her life, Jane's life begins to closely align with Jane Eyre's in Lindsay Faye's Jane Steele. After the death of Jane's mother and cousin, Jane is sent to the Lowan Bridge School. She strives to survive in a brutal and twisted environment governed by Vesalius Munt, the director of the school. While at Lowan, Jane meets and befriends a young student, Rebecca Clarke. Years go by without Jane committing any major transgressions, and then she is forced to act on behalf of her friend Clarke, who is starving to death. Her action results in her second murder. Jane and Clarke leave Lowan and fend for themselves in London for a few years when tragic circumstances force Jane to act once again. By the age of 24, Jane has found out that her aunt has died and that her family estate has been taken over by Charles Thornfield. Fortunately for Jane, Mr. Thornfield is seeking a governess for his young ward. Needless to say, Jane is hired for the job and seeks to investigate her inheritance while at the family estate. As many of you know, Jane Eyre is one of my all-time favorite books and one that I reread every year or so. When I found out that Jane Steele was a gothic retelling of this story I was beyond excited. Jane Steele is much more than a dark and twisted retelling of Jane Eyre; it is a story filled with dark humor, romance, murder, mayhem, and mystery. I was hooked with the line "Reader, I murdered him." Ms. Faye has crafted a host of colorful and memorable characters, including Vesalius Munt (headmaster at Lowan), Amy Lilyvale (teacher at Lowan), Mr. Grizzlehurst (publisher and erstwhile landlord to Jane and Clarke for a few years), Sam Quillfeather (constable and doctor of medicine), Sardar Singh (Thornfield's butler), Charles Thornfield, Sahjara Kaur (Thornfield's ward), and more. One of the many things I enjoyed while reading this book was that each chapter was prefaced by quotes from Jane Eyre and that Jane is constantly looking to that book for guidance in her life. I could go on and on about all of the things I liked about this book, but will sum it up with I enjoyed this book and can't wait to reread it (yes, I enjoy rereading standout books). If you like gothic stories or are a fan of Jane Eyre, then you'll definitely want to add Jane Steele to your TBR list. 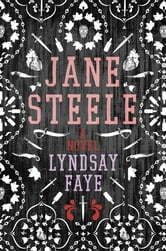 If you've never tried to read anything gothic then Jane Steele might be the perfect place to start. I look forward to reading more from Ms. Faye in the future.